The Longshed is a covered space for community use. It is over 30 metres in length, hence its name. When seen from the front doors, to the right is a large working space and to the left there is further space with a mezzanine floor above it. 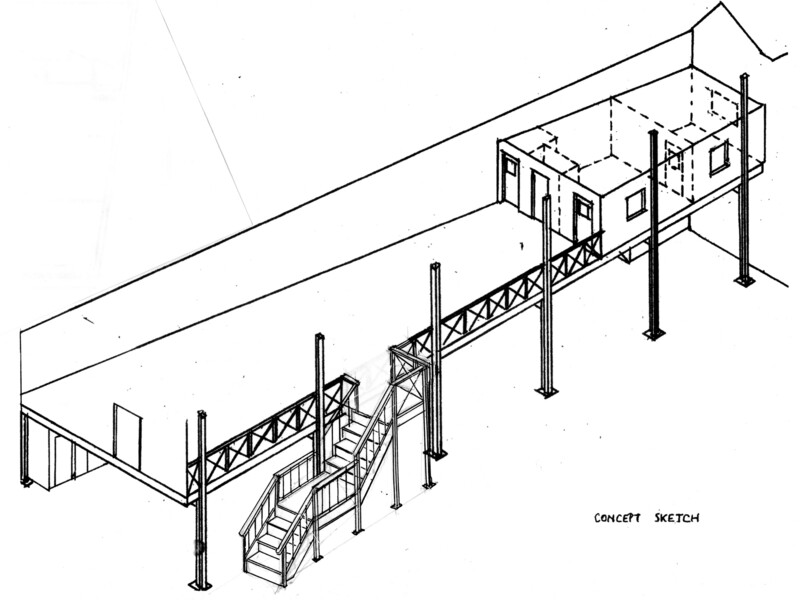 Steps ascend from a front entrance door of the shed to give access to the mezzanine floor. At the back of the mezzanine there are two offices. One is for site management and one is a staff common room. 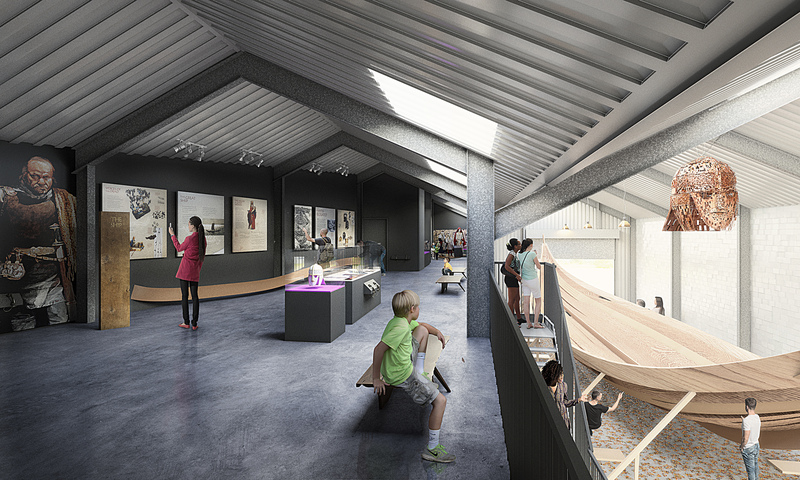 At the front of the mezzanine is a Heritage Resource area that will be used for community education activities. Early concept sketch. The front door is to the right, rear door to the left. Right: Empty mezzanine looking towards the rear of the building. 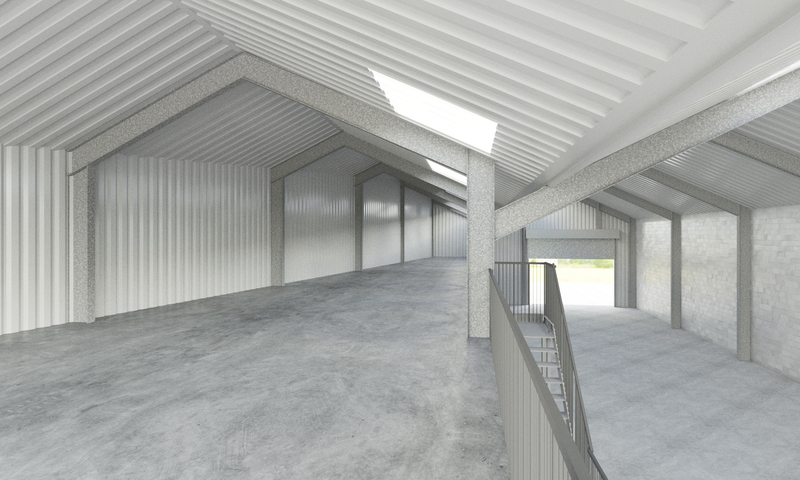 The total space available within the the Longshed is a flexible space for various community activities. The very first communtiy activity on the site combined music and dance in a specially commissioned production entitled The King's River. Local people and schoolchildren combined with professionals to celebrate the story of the ship burial and our maritime links with the river. When the buildings were handed to the Town Council the Woodbridge Riverside Trust began the process of fitting out the Longshed for community use. This process occupied much of 2018. 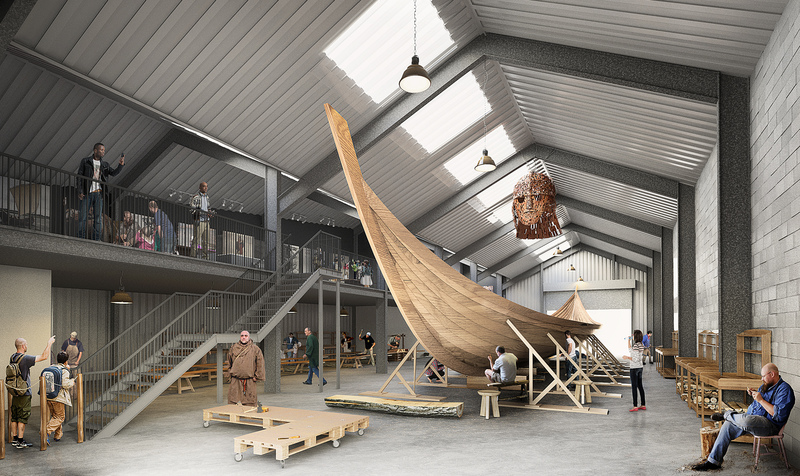 In October 2018 a group known as The Ship's Company began the process of organising the full-size reconstruction of the Sutton Hoo ship in the Longshed. An actual photograph of the interior looking from the rear towards the front. An artist's impression looking from the front towards the rear. 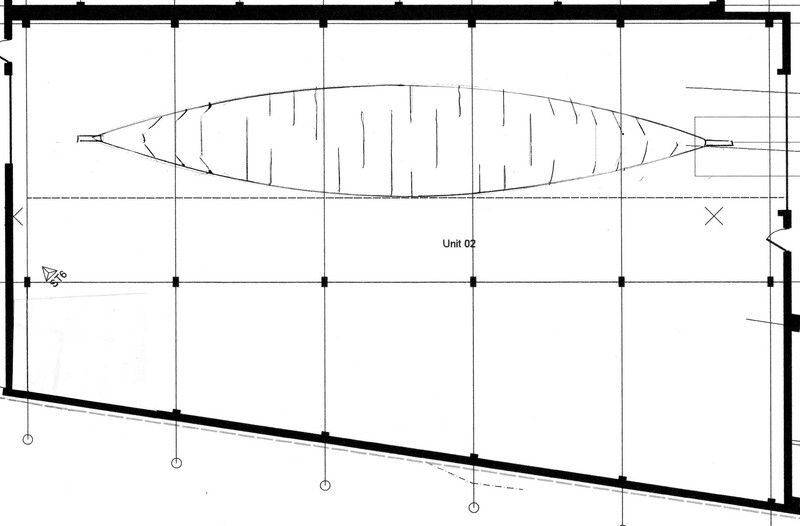 More pictures of the drawing of the ship FULL SIZE attached to the buildings. Many thanks are due to the sponsorship of our local Drain Doctor Plumbing that made this possible. The Kings River production ran in July 2017. "The King's River" is a newly composed community musical theatre led by professionals in 2 parts, both relating to the story of the discovery of the Sutton Hoo burial ship and the treasure. The composer is Jana Rowland and the librettists are Sylvia Fairley and Dominic Shea. "The King's River" was written specially to celebrate the opening of the development and the new community space and Longshed after more than 20 years of inactivity. In July the local papers around Woodbridge printed an article. As we were having a musical celebration The King's River, the article had woven into it some words taken from a 50 year old Celebrated Song. Readers had to find the words in the article and they were asked - Do you know the song? Participant with the correct answers were entered into a draw. The song was Sergeant Pepper's Lonely Hearts Club Band. A second FREE draw ran in the Riverside Theatre for the duration of the performances of The King's River. Here are some pictures of the Draw being made and a lucky winner receiving their prize.